One of the challenges I’ve found in talking about environmental justice occurs when justice claims seem to oppose economic ‘development.’ In short, marginalized people around the world too often find their claims about appropriate land use policies and practices ignored or outright dismissed if these claims contradict large-scale industrial development. For example, in the video below, the Dongria Kondh tribe in India tried to block the onset of open-pit bauxite mining sponsored by the transnational company Vedanta. The Indian federal government and Vedanta made fairly similar arguments – opposition was ‘irrational,’ particularly since the arguments made by the Dongria Kondh seemed to rest so much on emotional, religious and cultural appeals. Surely, these should matter little to the possibility of GDP growth, modernization, and capitalist development. This is something we’ve seen before, including in this country. However, the Dongria Kondh remained unconvinced: refusing to compromise on their vision of the sacred nature of the mountain, the tribe remained steadfast in their opposition to mining. As described in this article by the Telegraph, one of the major villages, Lakhapadar, voted to ban mining in a move that was recognized as legitimate by the Indian Supreme Court. While the Indian villagers are not convinced that this ban is permanent, it still represents a hope that even the marginalized, if supported by legal institutions, can have a positive impact on environmental practices as linked to social justice. This entry was posted in Conservation, Environmental Rights and Justice, Green Consumerism, Morality and the Environment, Nature Preservation, Sustainable Development on October 29, 2013 by Kemi Fuentes-George. I’m not hating on Norman Borlaug. His innovations in improving the yield of agricultural crops through genetic modification and cross-breeding have undoubtedly contributed to curbing hunger and malnutrition in under-consuming countries, particularly in Southeast Asia and Sub-Saharan Africa. But the Green Revolution he inspired has left behind a toxic legacy. In order to support the new breeds of plants produced, the agricultural industry produced hundreds of thousands of tons of pesticides a year through the 1950s, 60s, and onward. Unfortunately, it turned out that many of these pesticides contained/contain toxins and persistent organic pollutants. Things like lindane, aldrin, dieldrin, chlordane, heptachlor, and DDT – carcinogens, endocrine disruptors, bioaccumulators. While, to the international society’s credit, we did manage to ban the production and use of many of these chemicals through instruments like the Stockholm Convention, we are left with tens of thousands of tons of these compounds, idling in sometimes poorly stored containers worldwide. Africa alone has 50,000 tons of these now obsolete pesticides, which have occasionally been unintentionally released into communities by leaks and poor disposal practices. Fortunately, through the help of funds by the World Bank, and with the support of the Stockholm Convention, the international society is starting to get rid of these pesticides in a reasonably safe manner, but this should introduce a note of caution in the rapid industrial production of poorly tested compounds. This entry was posted in Corporate Behavior, Green Consumerism, International Relations, Toxics and Chemicals on October 13, 2013 by Kemi Fuentes-George. I suppose this was inevitable. Yesterday was Saturday, and being in the Yucatán, with no interviews lined up for today, my options were 1) hang around the hostel, and continue working on my paper via notepad and pencil (taking it back to ’92, y’all), or 2) go to the beach. Only a madman would have chosen number 1. So: I took a shared taxi to Puerto Juárez, then a $7 ferry to Isla Mujeres. Lovely beach on Playa Norte – you can walk out 100m, and never have the absolutely crystal water go further than chest high. But here’s the thing: this is a highly touristic zone, and the sun-sensitive visitors to Mexico also take this ferry all day for sand-and-beach. I happen to be highly allergic to oxybenzone, one of the most popular ingredients in sunscreen, and all it takes is one brush against, say, a deck chair recently used by a Coppertone-slathered individual, for me to break out in rashes, itching, and suppurating swelling (helpfully alleviated right now by very, very high doses of Benadryl – which also has the side effect of making me high as a kite). Now, I’ve thought a lot about oxybenzone over the years, having had multiple reactions and exposures to it, despite my best efforts to avoid it (I once unwittingly shared a straw with an amiga that used an oxybenzone-laden chapstick and came off looking like Mick Jagger), and have focused on two things that I find interesting/aggravating. First, as many of you will find out, it is found in a wide, wide range of cosmetic products – look at anything that has the letters SPF on it, and chances are it has oxybenzone, or its relative, benzophene-3. Second, it is an endocrine disruptor (see above link). Now, it’s not the only way to get sunscreen; you can use anything that has inert chemicals, such as titanium dioxide, or zinc oxide and get much, much better coverage. Problematically, the metallic sunblock is oldschool, and leaves a faint, whitish layer on your skin when you brush it on. Not very stylish, yeah? Plus, I am sure that the vast, vast majority of users are completely unaware that oxybenzone is harmful, not just to myself, but to all users, in particular infants and small children. But this I thought was symptomatic of one of the major challenges to human health: we are surrounded by potentially harmful chemicals every day, ostensibly in the name of convenience. Eventually, we learn about them, but often only after concerted action against the inertia, apathy, and perhaps active resistance of those who receive some benefits from distributing them. While we, as an international community, have eventually responded to some of these concerns, banning some harmful but ubiquitous products at the domestic level in the 1970s and 1980s, and by internationalizing the campaign against toxic substances through instruments such as the 2001 Stockholm Convention on Persistent Organic Pollutants, it is still clear that in many ways, our attitudes towards dangerous chemicals hasn’t changed much since the 1960s. The types of chemicals and products vary, and over time, awareness-raising leads to some civil society challenges to particular compounds, but toxins remain profitable, and information moves more slowly than commerce: hence, the continued ubiquity of harmful chemicals. This entry was posted in Corporate Behavior, Green Consumerism, Toxics and Chemicals on June 10, 2012 by Kemi Fuentes-George. Well, I suppose it’s about time that I started blogging again. Don’t worry; nothing environmentally bad happened between December 12 and today – or I would have caught it. Clearly. On Thursday, I heard an interesting report on NPR. Climate scientists, such as Durwood Zaelke of the Institute of Governance and Sustainable Development, and Drew Shindell of NASA have suggested a new, effective way to fight climate change: instead of attempting to create treaties or institutions to deal with carbon dioxide, we should focus on reducing our global emissions of soot and methane. The rationale behind doing so sounds very seductive: 1) both these gases have a higher Global Warming Potential (GWP) than carbon dioxide per unit weight – methane is 21 times more powerful than CO2 per weight, while soot (comprised of incompletely combusted carbon, sulfur, organic carbon and other chemicals – also known as “black carbon”) has a GWP of 680; 2) as illustrated by NASA, both methane and soot are potentially harmful to human life – soot, because it exacerbates pulmonary and cardiovascular illness, and methane, as it contributes to ground-level ozone; 3) both soot (despite its carbon component) and methane have shorter atmospheric lifetimes than CO2 – one or two decades, as opposed to hundreds of years. Consequently, concentrating efforts on soot and methane mean you would be able to discern greater changes in atmospheric CO2e accumulation. In fact, Shindell was lead author on a paper, published in Science Magazine, that suggests focusing on these two gases would reduce the amount of global warming from the projected rate of increase by 0.5 degrees Celsius by 2050. This is no small potatoes, considering that the margin of increase recognized by the IPCC as tolerable for human society is a 2 degree increase over current global averages. Finally, and I suspect this may be a more important development than anything else, combating soot and methane means you’re less likely to confront the industries – transport and energy – responsible for producing carbon dioxide. Methane primarily comes from agriculture and landfills, particularly in less developed countries, while it is also a byproduct of coal mining. Soot comes from biomass stoves, burning wood and dung, which again are largely used in developing countries. Not surprisingly, this idea – treating climate change by focusing on patterns of behavior that are not connected to vested industrial interests – has received a lot of vocal support, including among conservative researchers. “So rather than focusing only on carbon dioxide emissions, where we have to make a tradeoff with energy prices, this strategy focuses on ‘win-win-win’ pathways,” says Jonathan Foley of the University of Minnesota. “This is an important study that deserves serious consideration by policy makers as well as scientists,” says John D. Graham, former OMB head under the Bush administration. Obviously, the proposals advanced by Shindell and his co-authors, if funded, would provide immeasurable benefits. 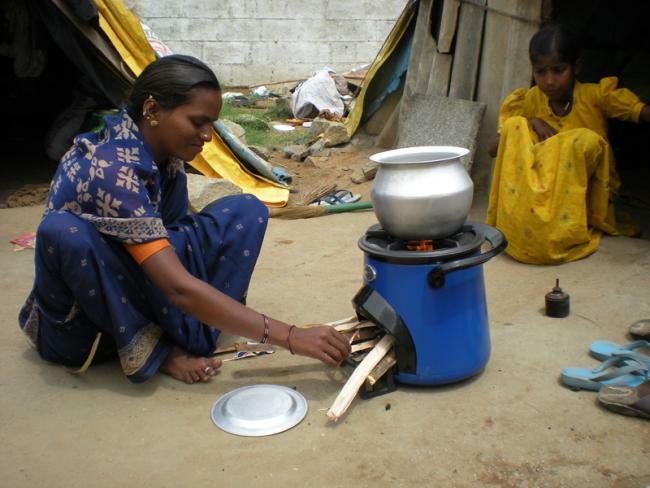 Reduce cardiovascular illness among lower income, biomass stove-using populations; reduce ground-level ozone; mitigate short-term climate change. But, I worry that the attempt to focus on other gases may present a moral hazard, if policymakers and the public lose sight of the main problem, which remains carbon dioxide. While soot and methane are comparatively speaking, short term problems, ‘solving’ them as issues without dealing with the main driver of climate change will only postpone severe climatic problems. Recall that carbon dioxide lasts for about 100 years in the atmosphere. The catastrophic implications of global warming would thus be postponed until well after our natural lifetimes, but what about afterwards? Surely we have a moral obligation to consider future generations. First, that last sentence is misleading. The entire EU bloc has been more than willing to restrict CO2 emissions, quite sharply, and has done so even in the face of a global recession. Rather, a few (but key) governments (you know who they are from following Durban, I imagine) have refused to address CO2, leaving us all with the bag. Second, if we want to characterize CO2 as a bully, I would hope that we as a global society will eventually generate the courage and determination to confront that bully, rather than acquiescing each and every time. This entry was posted in Climate Change, Green Consumerism, Green Energy, International Relations on January 15, 2012 by Kemi Fuentes-George. Season’s Greetings! Here’s a question I was pondering: how can you have a more environmentally friendly Christmas? * This may be more difficult than it seems. First, environmentalists are not generally known for their optimism, joyous spirit and good cheer – all of which are presumably necessary for holiday celebrations. Second, Christmas represents gross consumerism and the purchase of disposable goods (particularly by the richest 20% of the world, which consumes 80% of goods and services), most of which are produced by underpaid labour across the globe – then shipped here – all of this, of course, necessitating the burning of more fossil fuels, and oh Lord, I’m doing it again. So, which is better for the environment: cutting down a tree, or purchasing an artificial one? The answer is slightly more nuanced than you might think. In fact, last year, PE Americas conducted a Life Cycle Analysis (LCA) of the most common artificial trees and the most common types of real trees to get to the bottom of this and found that the results are mixed (PDF). In short, artificial trees are reusable, and the vast majority of them are recyclable (which may not be widely known). However, their manufacture requires the production and use of polyvinyl chlorides (PVCs), which can lead to the emission of persistent, bio-accumulating, and toxic compounds including dioxins and PCBs. While the risk of absorbing dioxins from your own, personal Christmas tree is low, at the point of manufacture and disposal, the risk is much higher – particularly since, as the LCA shows, much of the artificial Christmas trees are produced in China. At the same time, if you’re concerned about emissions of GHGs, keeping an artificial tree for longer than 4 years lowers your carbon footprint more than if you bought a real tree each year – particularly if doing so requires shipping the tree for long distances. Moreover, as agricultural products, Christmas trees often require pesticides, including Roundup and lindane, which is a persistent organic pollutant (POP). Personally, my preference is to go for the lindane-enhanced real tree. They smell better than the artificial ones – all piney, and delicious – and if you manage to buy local, they tend to be better than, or even with, artificial trees in terms of GHG emissions. In addition, by avoiding the production of PVCs, real trees are less likely to contribute to dioxin production. While lindane is incredibly toxic, dioxins may be the most problematic of the widely-used POPs. No, this isn’t about the starving children in Ethiopia (and I never understood how eating all my food helped the starving children in any way – why couldn’t I just ship my casserole to them instead, huh Grandma?). Rather, when it comes to Christmas dinner, try to eat less, but eat all of what you take. In a 2009 study (PDF) carried out by a National Institute of Diabetes in Bethesda, Maryland (and published by the Denmark Institute of Preventive Medicine), food waste has a deleterious impact on the environment. Wasted food means wasted water and wasted fossil fuels, both in production and disposal. In addition, producing food we don’t eat requires the introduction and emission of GHGs, pesticides, and herbicides – in addition to agricultural runoff and other forms of pollution. It’s bad enough that we have to do this for subsistence – it’s downright insulting when we contribute to these processes for no productive reason. In fact, the study indicates that 1/4 of freshwater consumed in the US goes to the production of food waste, a serious problem considering the water shortages plaguing the Southwest of the USA. Of course, the solution is not really to eat everything that has been produced on the market – hello, rising obesity rates – but rather, to eat less (but hopefully eat better food). And eat it all! Get good gifts! Try to be thoughtful, instead than buying something likely to be disposed, just to have an item under the real/artificial tree. I personally would like to reinstate cash as an appropriate gift, but also consider donating to a charity in the name of someone as well. Donating to charity also brings socioeconomic benefits, as well as environmental, considering all the people who are doing without in these trying economic times. *I realize this leaves out all those who don’t celebrate Christmas; hopefully there will not be too many posts that are this parochial. This entry was posted in Conservation, Green Consumerism on December 21, 2011 by Kemi Fuentes-George. Now that we know that the only thing coming out of the recent COP-17 at Durban is an agreement to agree in the future, and the Zombie Protocol, the question becomes: what are nations going to do to address climate change? In a move straight out of a Schumacher film, Mongolia is planning to engineer ice shields to keep their capital city, Ulaanbaatar cool – particularly since Mongolia has warmed 3x faster than the rest of the world on average. While this may or may not work (and it’s very doubtful that it will), it’s somewhat unfortunate that Mongolia, with a mere 15.6 million tons of CO2e (PDF), or 3 million tons per capita is both a tiny contributor to global warming, and particularly vulnerable to the changes already being observed worldwide. Moreover, while climate mitigation is almost certainly something that countries should be investing in, engineering solutions to global warming is only a small and potentially problematic response to the emerging crisis. Approaches like this, or other, more complex geoengineering solutions such as (seriously) space mirrors – contemplated by the UN and IPCC, no less – are flawed in that they 1) take away attention from the root causes of the problem, by not addressing underlying consumption (indeed, they make it easier for richer societies to continue consuming, as long as they pay their way in technological solutions); 2) may cause environmental problems of their own – particularly in doing things like (again, seriously) dumping iron in the ocean; 3) in the words of David Attenborough (yes, THE David Attenborough), are “fascist” – they place too much power in the hands of rich nations. I mean, controlling the weather is something straight out of a bad science fiction movie. We’ll keep an eye on things, but hopefully we’ll spend more time investing in ways to cut consumption, rather than punting it down the road. In the mean time, enjoy these chilling puns! This entry was posted in Climate Change, Corporate Behavior, Green Consumerism on December 14, 2011 by Kemi Fuentes-George. Worth, Literally, Millions of Dollars! They have a wealth of information on forest and carbon markets, including work on REDD. Check their site out, see what you think, or see the new links provided to their reports in the Research and Resources tab. This entry was posted in Conservation, Corporate Behavior, Green Consumerism, Nature Preservation on December 2, 2011 by Kemi Fuentes-George. Second, the Obama administration and the State Department recently announced that the project would be sent back for review, citing the environmental and socioeconomic considerations raised by the specter of continued oil dependency and dirty extraction. However, any optimism about these developments should be severely tempered. While the guaranteed protection of the Ogallala aquifer is a good thing, the obvious question that emerges is, why were they threatened in the first place? Moreover, a careful examination of the State Department’s announcement on the Pipeline clearly indicates that the delay 1) is primarily to find a less contentious route for the proposed oil; 2) times the final decision-making such that the policy will be determined after the election. A more cynical person than I would suggest that Obama is primarily trying not to alienate his remaining progressive-environmentalist constituency, while intending to go ahead with it anyway. 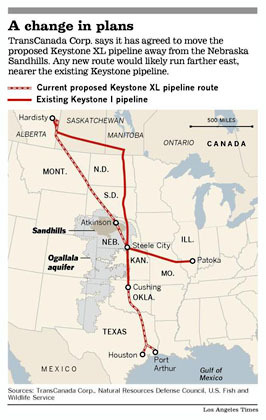 But, if the next President is a Republican, well, the possibility of the Pipeline becomes a certainty. Take a look at the rhetoric surrounding the issue: obviously, you have industry groups like the American Petroleum Institute stating that the Pipeline will create “…thousands of jobs almost immediately,” something that has to be a concern for Obama given his poll figures as of late. More colorfully, Rick Perry has pointed out that our dependence on foreign oil, much of it produced by nationalized companies in countries such as Saudia Arabia, places American troops and security at risk. We strengthen hostile regimes, because we fill up our SUVs with their product. (Ironically, this is an argument made by environmentalists for reducing oil consumption – inimical to the Keystone XL). In any case, despite the superficial progress, there are a plethora of well-reasoned objections, on clearly stated environmental grounds, to the project as a whole – not just the proposed expansion through the Sand Hills. In the Colbert Report, Middlebury’s own Bill McKibben critiques the whole idea of the project. One final point: while McKibben’s argument is sound, it seems as if there was not enough time on the Report to get into one of the more troubling aspects (to me) of the whole production of the Keystone. Even if we were guaranteed that the transit of oil were safe in the US, oil extraction is severely problematic for the people who live near the tar sands: indigenous and First Nations peoples. As can be seen in this report by the NRDC (TarSandsInvasion-full [PDF]), the extraction of oil from tar sands is immensely hazardous to the local ecosystems upon which indigenous people depend. Air pollution, and the seepage of toxins into groundwater, aquifers, and local ecosystems have led to high rates of cancer, asthma, acid rain, and the accumulation of toxins such as cyanide and ammonia. Not surprisingly, and as is the case in the US, indigenous people in Canada are at the lower end of the socioeconomic totem pole. It is important to keep in mind, when we think about environmental problems, that some populations are more vulnerable than others. Thinking about the Keystone XL (and other environmental issues) should raise questions, not just about consumption, local ecosystems, and wellbeing – but also about demographics and social identity. Who benefits? Who loses? Do certain populations lose more? In so doing, we should oppose environmentally harmful projects, not just on the basis of ecological concerns, but also on the basis of human rights, justice, and socioeconomic equity. This entry was posted in Corporate Behavior, Environmental Rights and Justice, Green Consumerism, Green Energy, Morality and the Environment on November 18, 2011 by Kemi Fuentes-George.